Despite having a life expectancy of only a few months during her operational missions, Christine volunteered to serve in three different theatres of war. From Hungary she skied across the Tatra mountains in blizzards of minus thirty, taking money and propaganda into occupied Poland, and arranging to smuggle men and information – the latter hidden inside her gloves – back out. In Egypt, where a British SOE memo notes that her ‘admittedly libelous’ code name was ‘Willing’, she filled a useful role in information gathering. 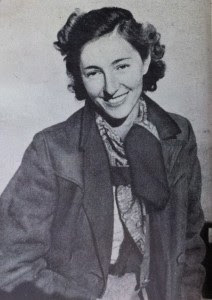 However she earned her highest decorations for her extraordinary work helping prepare the way for the Allied liberation of France, having been the only woman dropped in by parachute from Algeria, in July 1944. And yet Christine’s story is little known today. The reasons for this are to a large extent personal. In the days after Christine’s brutal murder in post-war London, in 1952, sensational headlines blazed across the British papers, ‘Kindness led to Murder’, ‘Drama of Quiet Countess who was British Secret Agent’ and ‘Heroine Dared Me Three Times to Kill Her’ among them. Distraught that ultimately he could not save her life, Christine’s on/off lover and long-term soul mate, Andrzej Kowerski, made it his mission to at least now protect her reputation. Roping in a group of men, mostly former agents, who adored Christine, he created the ‘Panel to Protect the Memory of Christine Granville’. Several articles and two proposed books, one by Christine’s former lover Count Wladimir Ledóchowski, the other by her colleague, the Ill Met by Moonlight author Bill Stanley Moss, were quashed. And yet as Count Ledóchowski’s son has said, ‘the death of heroes is not usually followed by panels to protect their memories and stop books about them’. Part of what made Christine so successful is that she did not operate, or live, like a woman of her time. My new biography of her is called The Spy Who Loved because Christine loved life in its fullest sense. She loved adrenalin and adventure, she loved men – she had two husbands and numerous lovers, and above all she loved freedom – both for her country and for herself. Ironically this twin passion, for action and liberty, that helped her to be so successful during the war, made her far less acceptable in the peace. After her death the men who had jumped into Christine’s life, ‘like parachuters into unknown territory’ hoped to protect Christine’s reputation and with it, in several cases, their own, in a highly judgmental age. Before his execution Christine’s murderer claimed that ‘to kill is the final possession’. He was wrong. Nobody possessed Christine, not her father nor either of her husbands, not any of her lovers and certainly not her killer. The resistance burning within her was too strong. Christine Granville is long overdue recognition, her story deserves to be told and her reputation set free. 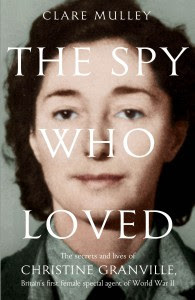 Clare Mulley’s The Spy Who Loved, the secrets and lives of Christine Granville, Britain’s first special agent of WWII, is published by Macmillan. See here for History In An Hour’s review.